The United Nations with the expert assistance of the International Federation of Surveyors (FIG) and other relevant organisations support the preparation of a regional and global compilation of optional components of a cadastre, including legal aspects, land policy, institutional arrangements, technology and economics. The preparation of case studies of cadastral systems and cadastral reforms, such that countries of the region engaged in establishing or reforming a cadastre may be aware of various options and learn from the success and failures of others. Due to the international importance of the subject, the meeting was included in the Habitat II calendar of events entitled “the Learning Years”. This activity was also part of the efforts to develop an active response to the problems of land management and environmental protection as stipulated in the Global Plan of Action for Habitat II, and to the recommendations contained in Agenda 21. As a result, an Inter-Regional Meeting of Experts on Cadastre was held in Bogor, Indonesia from the 18 22 March, 1996. The United Nations worked closely with the Indonesian agency Bakosurtanal and the International Federation of Surveyors (FIG) in organising the meeting, and received an important contribution from the Australian Agency for International Development. To develop a document setting out the desirable requirements and options for cadastral systems of developing countries in the Asia and Pacific region and to some extent globally. The meeting recognised that all countries have individual needs and requirements, but that countries at similar stages of development have some similarities in their requirements. As such the meeting primarily examined the requirements of three groups of countries, namely newly industrialised countries such as Indonesia, countries at an early stage of transition such as Vietnam and the South Pacific countries. The meeting adopted the definition and description of a cadastre as set out in the FIG Statement on the Cadastre. Reference was also made to the two previous UN meetings of cadastral experts (1972 and 1985) and the Land Administration Guidelines prepared by the United Nations Economic Commission for Europe in 1996. The meeting recognised that the key to a successful cadastral system is one where the three main cadastral processes of adjudication of land rights, land transfer and mutation (subdivision and consolidation), are undertaken efficiently, securely and at reasonable cost and speed, in support of an efficient and effective land market. As such the meeting concentrated on these three cadastral processes to help identify desirable or appropriate options for cadastral systems. In considering the range of options, differences were highlighted for the three major groups of countries identified. The meeting also recognised that increasingly a successful cadastral system is based on a strong and cooperative working relationship between the government and private sectors. This involves the roles of professionals in private practice, and the roles of professional societies and associations. All discussions attempted to highlight this relationship. While the meeting focussed on the needs of the Asian and Pacific region, the meeting also considered the requirements of three other groups of countries to a lesser extent—namely the western developed countries, Eastern and Central European countries moving to market economies, and the African states. Welcome address by Mr R.W. Matindas, Chairperson, Conference Organising Committee. As the Chief of the Indonesian Organising Committee, first of all let me welcome you to this meeting. I highly appreciate your prompt response to the UN invitation to attend this meeting, and the time you have made available from your busy working hours as well as your effort to fly thousand of miles from your home country to participate in this Inter-Regional Meeting of Experts on Cadastre. By this morning, delegates from fifteen of the seventeen countries scheduled to participate in this meeting have already arrived, namely from Australia, Cambodia, the People's Republic of China, Bulgaria, Malaysia, New Zealand, Republic of Korea, South Africa, Sweden, United Kingdom, Vietnam, The Philippines, and Indonesia. The delegate from Canada sent her regrets that she could not attend the meeting. Before I continue with my report, I draw your attention to the sad news we received last week that Mr. Pomaleu Salaiau, Surveyor-General of Papua New Guinea, could not be with us today. He passed away on Friday, 8th March, 1996. At this opportunity, allow me to recall the last facsimile I received from him, dated February 13, 1996, I quote: “This is to confirm that the Surveyor-General will be available for the Experts on Cadastre Meeting on 18 - 22 March, 1996. Cheers! P. Salaiau, Surveyor General.” Ladies and gentlemen, Mr. Pomaleu Salaiau was well known to us, he was a very capable hard working man and a friend of everyone. We will miss him very much. With your agreement, I ask you all to join me in standing up and giving a moment of silence in remembrance of him and all the work he has accomplished. Thank you. This Inter-Regional Meeting on Cadastre organised jointly between United Nations, Bakosurtanal and FIG was at first scheduled to proceed in December 1995, but then postponed to March 18-22, 1996. Thanks to the facsimile technology, since January 1996 a speedy communication could be established with the United Nations Department for Development Support and Management Services. I have been in extensive contact with Mr. Valeri Moskalenko, Professor Ian Williamson in Melbourne, Australia, Professor Peter Dale in United Kingdom, and all cadastral experts who are participating in this meeting. In parallel, we also have had several meetings with our National Land Department which gave us full support to conduct this meeting, through the setting up of an Indonesian delegation to fully participate in this meeting. As you are aware, the funding of Experts and Observers to attend this meeting was provided through the United Nations Regular Program of Technical Cooperation for one expert per country, which covers travel, Daily Subsistence Allowance (DSA) and insurance. The Government of Indonesia/BAKOSURTANAL has contributed in the form of a subsidy to the DSA to meet the hotel accommodation and meals rate. As for the entitlements of experts/observers financed by their employer government, this is determined by the individual sponsors. This Inter-Regional Meeting of Experts on Cadastre is scheduled to proceed from today, Monday March 18, 1996 to Friday March 22nd 1996. The first day, Monday March 18 will consist of four sessions from 0900 - 1700. The first session is set up for welcoming addresses, while in the second session Professor Williamson will dwell on the detailed program and expected outcomes, and Professor Peter Dale will review the previous UN meetings, the Economic Commission for Europe Land Administration guidelines, and the FIG statement on the cadastre. In sessions 3 and 4, experiences of each country will be presented in relation to the plenary discussion on the socio-economic justifications for cadastral reform. The second day, March 19, will be preceded by the official opening by the State Minister of Agrarian Affairs and followed by country presentations and discussion in four sessions. On Wednesday March 20, one session is dedicated to parallel discussions in three working groups and three plenary sessions. On Thursday 21 March, the first session is given for working groups to discuss the administrative issues followed by one plenary presentation by working group. The remaining sessions of the day will be dedicated to working group discussion on technical cadastre issues followed by a plenary presentation. In the evening, the drafting committee will meet to prepare the final draft report and the final draft of the Bogor Declaration. A dinner will be hosted by the Minister of Agrarian Affairs followed by the official closing ceremony. On the last day, Friday 22 March, three sessions are scheduled for the presentation and discussion of the draft report and Bogor Declaration. The Organising Committee fully understands that this Meeting is tightly scheduled and will require a lot of energy and concentration from all of you. If we can be of any assistance to make your stay a pleasant one, please do not hesitate to let us know. Our staff will gladly assist you in your banking and ticket arrangement as well as to render any other assistance you may require. We truly hope that your stay will be a pleasant one and wish you a successful meeting. I thank you for your kind attention. First of all I am pleased to welcome you to this Inter-Regional meeting of Experts on the Cadastre, held in the beautiful surroundings of Arya Duta Lido Lakes Resort Hotel, at the foot of three mountains, Mt. Salak, Mt. Gede and Mt. Pangrango. Thanks to all of you for responding to the invitation to participate in this important meeting. As Chairman of the National Coordination Agency for Surveys and Mapping, also known as Bakosurtanal which is the Indonesian representative to the United Nations Regional Cartographic Conference (UNRCC) for Asia and the Pacific, I welcome the request from the UN Economic and Social Council (ECOSOC) to host this Inter-Regional Meeting of Experts on the Cadastre. As we all know, this activity arose from a recommendation from the 13th UN Regional Cartographic Conference for Asia and the Pacific in Beijing, People's Republic of China, in 1994, which is approved by the UN ECOSOC. Indonesia is also a member of the International Federation of Surveyors (FIG). In FIG, the Ikatan Surveyor Indonesia (the Indonesia Surveyors Association) is representing Indonesia. In this meeting the President of the Indonesia Surveyors Association serves as the Chief of the Organising Committee as well as the member of the Indonesian delegation to this meeting. Since the essence of this meeting is on cadastre, Bakosurtanal has received the full support from the Ministry of Agrarian Affairs and the National Land Agency. The State Minister of Agrarian Affairs who is also the Head of the National Land Agency has conveyed to me his willingness to formally open this meeting. He apologises that he could not open this meeting today because he is scheduled to attend a meeting with the People’s Representative Council, but he will formally open the meeting tomorrow. This shows that the issues on cadastre are considered a very important matter for Indonesia in entering the 21st century. In 1994, Indonesia started the Cadastre Reformation Program through the National Land Agency: Land Administration Project (LAP), which encompasses the components of the acceleration of Land Registration and Certification; institutional arrangements; and policies to support long-term land management. This program is felt necessary to respond to the pressing needs of extensive population migration from rural to urban areas as well as the allocation of land in accordance with environmentally sustainable development. The acceleration of Land Registration and Certification is carried out systematically as well as sporadically which is to be supported by the availability of geodetic control networks and large scale maps. To expedite the completion of this national program, our policy is to foster a close coordination between the sectoral agencies involved, as well as to provide a greater role to private practice and professional societies and associations as well as universities. The problem of cadastre in Indonesia is a complex one. During this meeting we intend to share our experiences in managing this matter as well as learning from the experiences of other countries. I understand that at the end of this meeting the ‘Bogor Declaration’ will be issued consisting of summaries of major issues raised in this meeting as well as identification of some key solutions. I personally hope that the Bogor Declaration could serve as a pillar of our intention to play an active role in contributing to the global need for responsible sustainable development on our planet Earth. Allow me in this opportunity to thank the UN ECOSOC and the FIG for sponsoring this meeting, for the preparation of necessary materials, as well as bringing all the distinguished experts from all parts of the world to this venue. Furthermore, I would also like to extend my personal appreciation to the support extended by His Excellency State Minister of Agrarian Affairs, Head of the Lands Department, Mr. Soni Harsono and all his staff to make this meeting a successful one. I would extend my thanks to the Department of Foreign Affairs and the Indonesian Permanent Mission to the United Nations for their invaluable assistance to make this meeting possible. Last but not least, I thank the organising committee which on short notice was able to set up all the arrangements for today’s meeting. My personal thanks is also extended to the PCO and management of the Arya Duta Lido Lakes Resort Hotel for rendering the professional management of this conference. I wish you all a successful and fruitful meeting, and please come back again to Indonesia. Thank you. Ladies and gentlemen, distinguished experts and observers. I have the privilege of welcoming you to the Inter-Regional Meeting of Experts on Cadastre, on behalf of Ms. Beatrice Labonne, Director of the Division for Environment Management and Social Development. First of all I would like to thank the administration of the National Coordination Agency for Surveying and Mapping of Indonesia, Bakosurtanal, which kindly hosts this meeting, the International Federation of Surveyors, which initiated this meeting and provides technical coordination, and the Australian Agency for International Development, which contributed to the financing of the meeting. The United Nations is pleased to organise this meeting with assistance from NGOs like FIG, which according to Agenda 21 should be considered important partners in the process of sustainable development. Land is the most valuable asset of humanity. Nearly 150 million Km2 of the Earth’s surface is dry land which provides all necessary elements for human life. In addition it is estimated that by the year 2000 the world’s population will exceed 6 billion, of which more than 50 percent will live in urban areas. All 26 urban agglomerations projected to contain more than 10 million inhabitants by the year 2010, are situated in developing countries. Indonesia itself with nearly 2,050,000 Km2 of territory is a home for more than 180 million people, or nearly 88 per Km2 on average. The growing demand for food, water, shelter, energy, recreational space and other commodities creates a tremendous pressure on the environment and land; conversely the degradation of land resource negatively impacts on the well being of people. To address these issues the Member States of the United Nations organised the Earth Summit in Rio de Janeiro in 1992 on Environment and Development, and the concept of economic growth and sustainable development has become the guiding principle of the work of the United Nations. The City Summit (HABITAT II) in June 1996 in Istanbul is the next international conference of this kind. The purpose of the City Summit is to address two themes of global importance: ‘Adequate Shelter for All’ and ‘Sustainable Human Settlements Development in an Urbanising World’. The present meeting is part of efforts to develop an active response to the problems of land management and environmental protection as stipulated in Agenda 21 and the Plan of Action for HABITAT II, and is included in the pre-HABITAT series of events referred to as the ‘Learning Years’. Effective land policy requires knowledge of what resources and productive land exist, how it responds to development pressures, the value that land resources represent to different sectors of society. The lack of knowledge of these elements makes land management difficult if not impossible. Cadastre, or the system of land registration, is one of the essential tools to assemble and process data on land from different sources and to display them in a clear, map and/or computer based graphical format. The United Nations efforts to prepare this meeting indicate again the importance which they attach to the land management problems. The Department for Development Support and Management Services has a long history of assisting governments in the development and use of cadastral systems. The mandate of the department in cartography goes back to 1950s. The Department assists governments in assessing the requirement of establishing or of strengthening land survey, topographic, cartographic and map production establishments, cadastral and Geographical Information Systems, and of Hydrographic Services. Subsequently it assists governments in the formulation of relevant technical cooperation project documents, and in applying results of operational research and latest development of technology. The most recent example is a project in Bulgaria to establish a GIS on polluted agricultural lands, including the collection, processing and management of land information for the purpose of land resources management and development, and environmental assessment. A number of seminars and training courses were conducted in previous years for developing countries, meetings of ad hoc group of experts on cadastre surveying and land management systems were conducted and the results were published in the proceedings of the United Nations Regional Cartographic Conference and the World Cartographic Bulletin. The most recent example of such a seminar is the International Seminar on Geographic Information Systems (GIS), ‘City Sustainability and Environment’ which was held in Cairo in December 1995. The seminar was regarded as an overwhelming success by the participants and an important landmark along the road to Istanbul. The results of the Seminar were reported to the 3rd Preparatory Committee for HABITAT II in February 1996. Though with extremely limited resources and under pressure of the present financial situation in which the United Nations now finds itself, DDSMS is still able to respond to the most demanding questions of sustainable development. The experts gathered in this hall have a great challenge before them which will require tremendous efforts and extremely hard work to achieve in a short time, the goal put before them. I hope that the results of the meeting will contribute to the implementation of Agenda 21 and Habitat II Global Plan of Action as well as to corresponding plans of the Member States. I look forward to closely interacting with the Government of Indonesia to ensure that the results achieved at this meeting are taken into consideration by the Member States in Istanbul. I wish you every success in your deliberations and I hope that collaboration with countries on this important topic will be fruitful and serve sustainable development. Distinguished Guests, Ladies and Gentlemen. I bring you the greetings of the FIG, the body that represents the international community of surveyors. It is a matter to me of great pleasure and pride that we have been able to support this important meeting. FIG is an international Non-Governmental Organisation accredited by the Economic and Social Council of the United Nations (ECOSOC) representing professional bodies of surveyors in nearly 70 countries. It was founded in 1878 but for many years its activities took place more often than not within Europe. It is only in relatively recent years that it has become truly international—during my Presidency for instance we shall have our four major annual meetings in Argentina, Singapore, England and South Africa. The primary objective of the FIG is to ensure that surveying services meet international needs. We seek to achieve this in part by collaborating with international agencies in formulating and implementing policies for the use, development and management of land and marine resources. The meeting this week here in Bogor is an excellent example of what we seek to do, helping to facilitate discussions that will I am sure lead to the identification of possible solutions to problems. And whereas each country is unique with its own social, political, economic, legal and physical environment there is much that we can all learn from each other. One of the objectives of FIG is to create fellowship and understanding so that through that we can learn from each other alternative ways of tackling complex issues. FIG also has a mission to support its member associations not only by providing facilities for continuing professional development through the holding of workshops, seminars and congresses and the dissemination of reports but also through empowerment. By empowerment I mean the process of encouraging people to recognise that they have skills and talents that are needed by society and helping them to develop self-confidence. If we take Agenda 21 for example there is much in that program that can of course only be undertaken by governments. But there is much that even the humble surveyor can do to help, be he or she in the public or the private sector. Agenda 21 is an opportunity for surveyors to use their skills for the benefit of humankind. The same applies in the cadastral field. Almost all systems around the world are ripe for modernisation. Some are already trying to achieve this, some already have but most are still struggling. New ideas and new approaches are needed. Cadastral systems and land registration are processes that underpin all successful modern land resource management programs. This is obviously recognised here in Indonesia from all that I know—indeed it is obviously recognised by all delegates attending this meeting for otherwise they would not have come. It is certainly something that is recognised by the FIG. At the risk of embarrassing him, I would single out Ian Williamson as someone who has contributed much not only to this meeting but to the development of cadastral systems around the world. As Chairperson of our Commission 7 responsible for cadastre and land management he has done more than anyone to promote cadastral issues around the world and I would like to thank him on behalf of FIG for all his support. Now is not yet the time to thank our hosts here in Indonesia, other than to say thank you for getting us off to such a good start. Nor is it yet time to thank the UN—that will come at the end of our deliberations. All I would like to say at this stage is that 'so far, so good'. We have all the makings of a great meeting. From the FIG side I certainly am looking forward to the next few days. I am also looking forward to identifying further areas where in the future we possibly can help to make a contribution. I wish this meeting every success. At the beginning of this session, Professor Williamson outlined the background to the conference and explained its objective. He then discussed the importance of including subsequent sessions on topics such as socio-economic and cadastral needs of different countries; justification of cadastral systems in developing countries; land markets, limitations to efficiency and effectiveness, and cadastral processes; traditional or customary land tenures; cadastral systems and informal land tenure; the role of the private sector; cadastral options; and the Bogor Declaration. Land tenure has been described as the relationship between Man and Land and although the gender implication of such a statement is open to question, what is incontrovertible is that the formal and informal relationships between people and the land that they use is of vital significance to every society. Ironically, it is of such importance that many people take it for granted—like the air that we breathe. It is only when systems begin to break down, just as when the air gets too polluted, that people are forced to take action. An awareness of modern problems in land registration dates back to just before the outbreak of the Second World War when work began on a comparative study into Land Registration by Sir Ernest Dowson and Mr. V.L.O. Shepperd. The work was eventually published in 1952 and was the first modern comprehensive documentation of cadastral issues. A year later, in 1953, the United Nations Food and Agriculture Organisation (UN FAO) published a monograph on the registration of rights in land. Written by the late Sir Bernard Binns, it has recently been updated and reissued, reflecting a re-awakened interest in land administration. The concerns in the early 1950s came about in part because of the need to ensure good agricultural production. When the UN FAO was formed just after the Second World War, people in Europe were starving while Africa was a net exporter of food. Today, the European Union is paying farmers not to grow food in what is called the set-aside program. At the same time, in parts of Africa people are now starving. In eastern Europe, agriculture did not keep pace with that in the west and with the transition of centrally planned to market economies there has been a revival of interest in land tenure. This transition has been accompanied by major reviews of cadastral and land registration systems. Each country is adopting a slightly different approach, reflecting its own history and culture. In all but computerization, rather than looking forward, many countries have been looking backward to their pre-nationalization systems. A previous surge of interest in land registration took place in the late 1950s and early 1960s when countries formerly under British and French colonial rule, gained independence. Diverse systems were established but unlike the present developments in central and eastern Europe, retained features that were determined by their colonial history. Countries in West Africa, formerly under British colonial rule, for example, have many features in common with each other but differ significantly from those countries that were administered by the French, all of which have systems similar to that in France. During the 1960s the British realised that it was time to take a fresh look at cadastral surveying and land registration and in 1967 commissioned a study by Mr. S. R. Simpson into land registration. This was intended to replace the work of the late Dowson and Shepperd but its focus was very much on the legal aspects of land registration. As a result a further study was commissioned in 1971 focusing on cadastral surveying within the Commonwealth, both works finally being published in 1976. The Committee consisted of six members, one from Sweden, one from the United Kingdom, two from the Netherlands, one from Germany and one from USA. There were no representatives from Asia, although the resolution had come from that region. The outcome was a succinct, simple and straightforward document that distinguished between registration of deeds and registration of title, discussed the legal, the fiscal and the multi-purpose cadastre and produced some guidelines on how cadastral surveys could be made cost effective. The techniques suggested included the use of photogrammetry in the initial establishment of a cadastre. The recommendations remain as valid today as when they were written. They have however largely been ignored. Simple photogrammetric techniques, for example, are still rarely used although there is one major exception in the Thailand Land Titling Project where the use of rectified photography has proved to be cost effective. The report marked a significant shift away from the idea that cadastral systems are concerned with land ownership and possibly land taxation to promote the concept that they are part of the basic infrastructure of society and are concerned with land information and land management. Both the 1972 and the 1985 reports mirrored the thinking of the time but they did not alter the practice of cadastre and land registration. In many countries the traditional approaches were and remain too deeply entrenched for there to be great change without political revolution. Nevertheless there are evolutionary processes that are going on in most countries today, forced by new technologies and the greater complexity of the societies within which we live. This is reflected in the convening of this meeting here in Bogor where common issues will be examined. It is also reflected in recent work by the United Nations Economic Commission for Europe where as part of its contribution to the forthcoming HABITAT II Conference, guidelines have been prepared for land administration. These have been made with special reference to countries in transition from centrally planned to market economies. The guidelines recognise the importance of land markets and the need to manage information about land in such a way as to secure optimum land resource management. The term 'land administration' was chosen to cover land registration, cadastral systems and all processes of managing the ownership, value and use of land. The link between the ownership rights, land use rights and the market value of land was recognised as important but the formal creation of such links is institutionally difficult to achieve. In many countries there are records of ownership held within the Ministry of Justice, records of value within the Ministry of Finance and records of use either within the Department for the Environment or else within the municipal administration and local authorities. Yet the use of land determines its value, as does the security of its tenure. Use rights and ownership rights determine what the citizens can do with their land and property. In many countries, when purchasing land, separate enquiries have to be made to determine ownership and use rights. In England, for example, checking local restrictions on the use of land can take anything from between ten days and a month thus delaying the transfer of a property. In most countries there are planning restrictions that affect what can be done with the land and hence its value. In some countries, buildings are divorced from the land on which they stand and are subject to separate administrative processes. Against this complex background there is a move to link data sets in a 'one-stop-shop' approach so that a citizen need only make enquiry at one place to find all the interests in any given piece of land or property. The almost impossible task of getting different Ministries to surrender their responsibilities and therefore their power over land matters can, from the perspective of the land owner, be avoided by using wide area computer networks linking each organisation. These linkages require the use of compatible standards but leave the responsibility for keeping the data up to date with those who generate the data in the first place. Thus the Land Registry can still be responsible for the accuracy of land title data while the planning authority can still be responsible for the restrictions on land use and the land owner can obtain a single view of the combined data base. Part of this approach is being driven by technology, part by a growing awareness that cadastral systems should serve the people on the land rather than the administrators in government offices. Of course many land registration systems have focused on serving the needs of land owners, for instance by guaranteeing the security of title and simplifying the processes of conveyancing but many have ignored the needs of the community for good land management by failing to provide relevant information. Similarly many cadastres have been created 'top down' serving the needs of the cadastral surveyors and record managers rather than the needs of land owners. Common ground is now being sought with emphasis both upon the requirements and responsibilities of the State and the needs of the individual. In this process there has been much debate upon the role of the private sector. Should the cadastre be under full governmental control with State surveyors and State notaries carrying out all the necessary work or should at least some of the work be done by the private sector? The answer will of course depend upon the political situation in individual countries but it is worth stressing that around the world an increasing amount of work that has traditionally been regarded as a governmental responsibility is now being undertaken by the private sector. There is also an increasing use being made of Non-Governmental Organisations (NGOs). The guidelines prepared by the UN ECE will formally be launched at the HABITAT II Conference. They have however already had an impact. At a meeting at the UN Headquarters in Geneva in February of this year representatives from 30 European countries came together to create a Meeting of Officials in Land Administration (MOLA). In future the so-called 'Officials' will come from governmental, cadastral or land registration organisations and will to some extent mirror a pan-European group called CERCO (Comite Europeen des Responsables de la Cartographie Officielle). CERCO is made up of the Heads of national mapping agencies and is a forum for the exchange of information on matters of mutual concern to European national mapping agencies—for instance cross border mapping or issues such as copyright on surveying and mapping data. MOLA hopes to play a similar role within Europe although it is acknowledged that each cadastre or land registration system currently operates as if within an island state and hence has little in common with its neighbours. Although it is essentially a government sector initiative, it plans to involve a wide community of experts including those in the private sector. It is possible that this will change with the impact of the General Agreement on Trade and Services (GATS) that is being administered by the World Trade Organisation (WTO). GATS will require the creation of greater opportunities for foreigners to work within a host nation's cadastral or land registration system. The European Union is already seeking much greater freedom of opportunity for its members to work anywhere throughout the Union. At present however MOLA is bound together more by a common interest in solving problems for instance in computerisation than in any move to share facilities or land and property data between countries. It is of course of interest that MOLA represents a European response to the 1972 request to the UN to set up 'a permanent committee to keep developments in this field under constant review'. It is probable that MOLA will in due course be anxious to market the expertise of its members on a global scale. At present however its focus is strictly European. There is therefore still no global 'permanent committee' in the sense envisioned by the writers of the 1972 report. As an ECOSOC accredited NGO, the International Federation of Surveyors (FIG) is going someway towards filling what is still the gap, principally through its Commission 7 which has been active in reviewing developments. FIG has for instance produced a Statement on the Cadastre that complements the work that has been done by the various United Nations agencies. It has also published two reports on general land tenure issues, one being the results of a Round Table meeting held in Melbourne, Australia with the UN FAO in 1994 and the other of two meetings held in Harare, Zimbabwe in 1995, one with the UN FAO and the other with the UN CHS (Habitat). What emerged from these discussions was concern that land tenure arrangements and cadastral systems in particular are not meeting the needs of the communities that they were originally designed to serve. UN CHS has for example laid much emphasis on the need to protect women's rights in land, the subject of a conference held in Sweden in 1995 and a matter of focus in the New Delhi Declaration in January 1996 that was issued at the end of the Global Conference on Access to Land and Security of Tenure. A striking feature of the New Delhi conference was the different perspectives on land tenure held by the representatives of African and Asian nations. Nevertheless the foundations on which they all stood were similar and it is only at the higher levels that differences are apparent. The FIG Statement on the Cadastre has attempted to get to that bottom level and as with the 1972 and 1985 reports and the work of the UN ECE it enunciates general principles that apply to all. The weakest part of all these studies is their understanding of land markets, possibly due to the fact that the reports have been prepared by administrators, lawyers or surveyors and not by economists. There is a general failure to quantify the economic imperative of good land record management through which comes good land management and a strong economy. In the west the relationship between security of title and security for investments has been taken for granted and is very difficult to assess in cost to benefit terms. All of the documents cited above make supportive statements and arguments for a good land titling system but none produces facts and figures to actually prove the case. What can be shown is that countries with poor systems of land records have relatively weaker economies than those with good systems. There is evidence that efficient use of development project funds may be greatly impaired by poor land information, especially in urban areas. It is in the cities and towns that land markets tend to develop more rapidly than in rural areas. There is of course great need for security of tenure in all areas especially for farm land but relatively little buying and selling of rural land takes place compared with urban. Much international aid has focused on rural development, often with the objective of increasing food production. The forthcoming HABITAT II Conference will focus the attention of the world on urban environments and the fact that over the next thirty or so years two thirds of the world's population will live in urban communities unlike today when two thirds live in rural areas. The prime focus in most of the cadastral studies referred to above has been on rural land which explains in part why there has been limited discussion on land markets. Today the cadastral debate often centres around the use of technology and the development of multi-functional land information systems. The latter involves more than the traditional players on the land titling stage - the lawyers, the surveyors and the land administrators. The thread that runs through the reports commented upon above includes such issues as the differences between the urban and rural environments and the respective roles of the private and public sector. What binds them all together is a search for the best way to respond to the needs of land resource management by recording the ownership, value and use of land in a way that is cost-effective and meets the needs of government and, most importantly, of the local community. That search is not yet complete and the challenge here in Bogor is to identify clearly the common problems, to look at the many different solutions that have emerged over time, but ultimately to choose the best way forward for each individual country, given its unique circumstances. The paper by Williamson (1996) provides a justification for cadastral systems in developing countries. The paper commences with a brief overview of cadastral systems and argues that the debate about such systems should move from whether cadastral systems are important or appropriate for developing countries, to what constitutes an appropriate cadastre for such countries. Land titling, land registration and land reform projects, or projects to regularise or formalise land tenure arrangements, all require the support of or result in cadastral systems. The promotion of the importance of cadastral systems in developing countries draws heavily on the experiences of the World Bank, the Food and Agriculture Organisation of the United Nations (FAO), the United Nations Centre for Human Settlements (Habitat) and several recognised international authorities. However, it is absolutely essential that each cadastral system is designed appropriately to serve the needs of the respective country. Otherwise a cadastral system can do more harm than good! There is a vast array of legal, technical, administrative and institutional options available in designing and establishing an appropriate cadastral system, again providing a continuum of forms of cadastre ranging from the very simple to the very sophisticated. The success of a cadastral system is not dependent on its legal or technical sophistication, but whether land rights are adequately protected, with those rights being able to be traded where appropriate (i.e. land rights can be bought, sold, leased and mortgaged), efficiently, simply, quickly, securely and at low cost. The developing world is dependent on the establishment of a system of property rights and property formalisation in land, and associated institutions, for economic development. Appropriate cadastral systems are important, if not essential, for such systems to be established. in providing significant social and political benefits leading to a more stable society, especially where land is scarce. In densely populated rural areas or areas of high value a cadastral system also permits an effective land market to operate and allows an equitable land taxation system to operate. In urban areas a cadastral system is essential to support an active land market by permitting land to be bought, sold, mortgaged and leased efficiently, effectively, quickly and at low cost. In addition a parcel based land information system (not necessarily computerised), based on the cadastre, is essential for the efficient management of cities. Cadastral systems permit land taxes to be raised thereby supporting a wide range of urban services, and allowing the efficient management and delivery of local government services. support national development in the broadest sense. Thus, the question is not whether cadastral systems are essential, but what constitutes from a technical, legal, institutional, administrative, economic and social perspective, an appropriate cadastral system for a particular country or jurisdiction at some point in time. The meeting discussed the motivation for the interest of institutional development of land administration in the participating countries. The question was formulated as follows: What is the justification for cadastral reform in the participating countries? All delegates acknowledged there is great interest in institutional development of the land administration system in the participating countries. This interest is manifested in relatively large investment in improvements of cadastral systems, including development of legislation, organisational methods, and technology, in order to meet the demand from society. The demand comes from the government, which has an interest in developing land administration systems to promote economic development, social stability and economic growth. But the demand is also high from the business sector, which wants clarity in security of tenure, and predictable rules and legislation as a base for investment decisions. Farmers and urban populations are also interested in secure titles to land, clarity and transparency of land tenure for the same reason. The table below shows the three most important reasons for cadastral reforms as listed by the participating countries. Reduced costs for land registration in areas with people who cannot afford the current costs. Provision for group titles in areas with customary tenure and in other areas in need of a low cost approach. Support for the development of natural resources and protection of the environment, and stopping degradation of soils and deforestation. Support for land use planning. Improved protection of land rights. Security of tenure and protection of land rights. Efficient land market and to promote investment in land. Secure titles to land to promote economic development. Provide information for land use planning. Standardisation of different systems to reduce costs and maintain security. Indefeasible title and ownership guarantee by government. Lower costs for land transaction to promote an efficient and unambiguous land market. Reduce litigation and boundary disputes. Promote economic growth and develop a land market. Avoid boundary and land disputes. Computerisation to speed up the reform and to improve accuracy. Facilitate zoning and planning in order to fix land reservation and land values. Improve rural land development bank and control credits. Increase revenue from taxation of land for local governments. Accelerate settlement ownership to prevent land fraud. Security of ownership and transactions. Integration of registration and cadastral surveying and mapping, and unification of rural and urban areas. Socio-economic applications of cadastral information. Reduce cost through use of modern technology. Speed up property transfer and lower costs. Provide efficient support for traditional land tenure. The participants at the conference represent a broad range of countries which have reached different stages in their development and completion of the cadastre. It was obvious that the main reason for countries which have not yet implemented a formal cadastral system for the whole of their nation, to continue and finalise the system, is to gain benefit from economic and social development. For countries with established cadastral systems, the emphasis is placed on matters to rationalise and increase the accessibility to their systems, in order to reduce the costs for the government and the users, with the help of modern information technology and through legal and organisational reforms of procedures. In many Eastern European countries, there is a strong political will to restore the cadastral systems and the parcels as they existed before nationalisation. In several countries, the aim of the cadastral reform is first of all to promote economic development through the establishment of secure and protected land rights, which can then serve as the basis for long-term investment decisions in land development—both in rural and urban areas. Another reason for cadastral development is to avoid land disputes and promote the development of a land market and access to credit. Secure tenure will increase access to credit with lower interest rates and increase real property values. These reasons were particularly mentioned by delegates from the Republic of Korea, Indonesia, Thailand, Malaysia, People's Republic of China, Bulgaria, New Zealand and Australia. The need for development of methods of market valuation and training of appraisers was especially highlighted by delegates from countries which are developing market economy systems. The discussions also identified the importance of each jurisdiction’s cadastral organisation developing its own vision and strategies aligned to its particular national development aims and priorities. Current management thinking and skills can be applied in cadastral organisations to achieve purposes and programs, and provide effective planning and implementation. Each country has to determine its own vision and directions so that it can align its functions and programs with the directions and priorities of its government, and with its own circumstances, environment and stage of development. It is particularly important that government and national organisation commitment be obtained so that new systems, technologies and developments are locally owned and accepted, and that local capacity is made available to sustain them in the long term. In many countries the main reason for cadastral reform is to promote political stability, social justice and equity, and economic development. In countries such as Vietnam, South Africa, Bulgaria, other Eastern and Central European nations, and Australia, this question is an important justification for cadastral reform. In several countries, different cadastral systems were developed for different purposes or through influences from other countries and adopted in different ways to the traditions existing in the country. Traditional land tenure systems represent another area of great importance, as all countries expressed a will to recognise traditional land tenure as a base for formal land registration. In several countries, the responsibility for land registration is divided into legal registration of documents and technical registration of the geographic location and land use of land parcels. The question of standardisation of different systems is important as a justification of cadastral reform in nations such as Thailand, Republic of Korea and Bulgaria. Group titles to incorporate traditional land tenure, but also to solve land disputes, are especially important in South Africa. The cadastre has been introduced in many countries in the world with the primary aim of facilitating the collection of governmental revenue through land taxation. Today, this is an important reason for cadastral reforms in Malaysia, Thailand and the Philippines, especially as a means of strengthening local governments. Reforms motivated by the desire to rationalise cadastral procedures and organisations, and to make information more accessible with the help of modern technology, were reported from the United Kingdom, New Zealand and Sweden. In Cambodia and Vietnam, the wish to computerise the cadastre in order to speed up the reform and facilitate access and reliability of the data is a strong driving force. Costs for land registration need to be reduced, at least for some types of land tenure, in South Africa. In Malaysia, computerisation is seen as a major solution to their problems, created by frequent use of temporary, qualified titles. Other motivations reported for cadastral reforms were to prevent land speculation (Republic of Korea) and to accelerate settlement ownership to prevent land frauds (Philippines). Almost all countries mentioned that the question of migration from rural to urban areas also is a driving force for cadastral development. The success of cadastral reforms is demonstrated in substantially increasing food production in Vietnam, and in increasing real property values, productivity, access to credit and general economic activities in Thailand. Lack of reliable cadastral records often is compensated for by society through the development of informal markets and rules. This may create unstable conditions, and has, in certain locations, resulted in higher transaction costs, higher interest rates (or no possibility for credit) and lower land values compared to areas with reliable cadastral records. Other negative impacts such as unsustainable land use and degradation of soils have also been associated with the lack of an established land management system/reliable cadastral records. The elements identified included: promoting investment through the provision of secure title for economic development; increasing revenue for central and local government by accurate identification of land use activity and property values; and standardisation of transactions to reduce costs and increase efficiency through simplifying procedures and unifying different systems. It was also emphasised that cadastral systems provided a base for effective zoning and planning, to assist economic decision making, and for the orderly reservation ahead of implementation of community and national facilities. The role of the cadastre in supporting lending and the efficient application of credit was also seen as important. This includes the reduction and avoidance of land and boundary disputes; the establishment of government supported entitlements to land title and associated rights; the establishment of security; the speeding up of property transfers and sales; reduction of costs; increased security of land rights and dealings; and the prevention of fraud in land transactions. This includes providing better information for land planning and better mechanisms for implementing planning policies and improving overall land administration; accelerated settlement and taking up of individual ownership to support economic growth; and support for socially desired land use and environmental considerations. This is required to reduce costs and provide rapid processing of transactions, and to increase the accuracy of procedures and improve access to associated databases. This is required to simplify procedures and operations, and develop standards to improve efficiency and user friendliness. There is also a need to simplify and remove overlaps in the activities of organisations involved in cadastral functions. Other general issues arising were the efficient support for traditional tenures through the provision of Group ownership, support for political stability through the advance of social justice, and the overall reduction of the cost of the land registration system. Figure 1. A Statewide Parcel-based Land Information System Based on a Legal Cadastre. the advantages and disadvantages of adjudicating individual land rights? the relationship between systems to record individual land rights, land use and land values. High level of confidence in the titling system due to government guarantee and the virtual absence of litigation as to boundaries (23 boundary determinations per year). Titles based on accurate survey executed by surveyors registered under the Surveyors Act. Process enshrined in statutes which include the registration process traceability of measurement, definition of standards, plan examination and adjudication. System has grown from an isolated surveys approach. There is a lack of overall mathematical rigour in the cadastral fabric. Small number of old system and Crown land parcels still without accurate survey. The map sourced digital cadastral data base is inconsistent in quality due to the variation of source material. This will be overcome over time by connections of the existing cadastral frame work to the survey network. The title registration and cadastral survey system supports a very active, effective and secure land market to permit rights in land being bought, sold, mortgaged and leased and for land to be subdivided and developed. The system is virtually litigation free. Land tenure or boundary disputes are virtually unheard of. The cadastral system is operated by a large number of highly trained professionals who are supported by well established professional institutions and universities. This is particularly the case for Surveying (1 licensed professional land surveyor/4,000 population) and Legal professions. 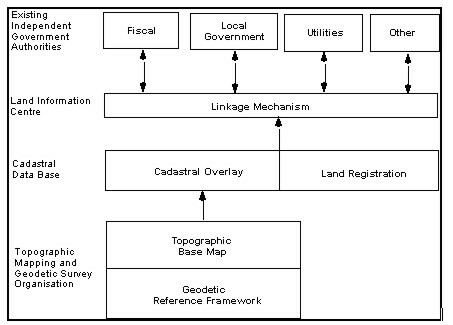 The cadastral system is highly centralised in one Land Titles Office. While this could be seen as one of the best aspects of the system, it could also be seen as one of the worst aspects. Without doubt centralisation allows a high level of coordination and computerization (Victoria has a complete digital cadastral data base) while at the same time it has restricted the availability of cadastral data at a local level. The cadastral system is still constrained by historic administrative arrangements which have their origins from the manner in which Australia was settled. This particularly relates to a separate Land Titles Office and the Office of Surveyor General. However recent times have seen the establishment of the Office of Geographic Data Coordination. The cadastral system is based on very accurate isolated cadastral surveys. The system has historically not used a State-wide coordinate system, nor is it map-based, although the State is slowly moving in this direction. The cadastral system is a relatively complex and expensive system. It is heavily directed at individual transfers for individual parcels for individual persons. Indefeasibility of title and rights - ownership is guaranteed by the government. Transactions are simple, unambiguous and inexpensive. Accurate land demarcation minimizes overlapping ownership and litigation. The registration of titles and surveys are done by different departments. This results in duplications, red tape, delays and backlog in the registration of FT. The provision for issuance of QT prior to final survey has resulted in 2.4 million QT’s that are yet to be converted to FT.
Largest population in the world, 1,200 million. Population density of 125 persons per Km2. Total land mass of 9.6 million Km2. (1/15th of the world’s area, and 1/4 of Asia). Per capita land area, 0.8 Ha. Per capita cultivated area, 0.09 Ha. People's Republic of China feeds 21.8% of the world’s population, with only 6.8% of the world’s cultivated area. Present cadastral management functions are: land use inventory, city and town cadastral inventory, and land condition inventory. National soil survey has been completed. Land registration started in 1988. A unified system of registration and certification of land rights will be established in the People's Republic of China in 2 years. Land Department for Guangdong Province established in 1985. Land administration tasks in the Province: cadastral management; land utilisation; administration of land use for construction, surveying, and place names. Land use inventory conducted using aerial photography, orthophotos, and 1:10,000 topographic maps. 1:10,000 topographic map or orthophoto map coverage of the Province is complete. Since 1985, cadastral inventory of 1,271 towns (77.5%) and 84,406 villages (68.1%) has been completed. Land registration and certification completed for 1,956,000 state-owned parcels and 8,168,000 collective land parcels since 1988, giving a certification percentage of 75%. In day-to-day cadastral management operations, since 1993 there have been 155,000 transfers, mortgages and land use changes handled. Area of 111,000 Km2, with 58% being agricultural land. Engaged in moving from socialist political system and a centrally planned economy to a Western style democracy based on a market economy. Land reform is a key element of the transition, involving land policy, land tenure and land administration. Emphasis is on land tenure based on individual rights. Property rights for 5.4 million Ha of farming land to be restored. Rights will be restored to 2.4 million citizens to over 8 million parcels. As at 31/12/1995, property rights to 57% of farming land have been restored. Estimated that by end of 1996, 84% of land will have been returned to owners. 9.2 million people in the KwaZulu-Natal province of South Africa, 26% in informal settlements. The largest urban area in KwaZulu-Natal, Durban, 24% is informal (124,284 informal dwellings), housing half a million people. 7 million is informal settlement population of the whole of South Africa. This limits encroachment and boundary conflict problems. Through surround surveys, linked to the geodetic network, it will be possible to introduce less accurate surveys within the outside survey, either unintentionally (Development Facilitation Act) or intentionally. Makes an LIS more sustainable and cost efficient and when up and running will underpin the land reform programmes. This means that the land restitution process, as far as freehold areas of the country are concerned, is relatively easy, as far as the identification of the parcel and chain of owners in concerned. Land tax is facilitated. Property clause negotiations will determine to what extent land taxes need to be introduced. Professionals (land surveyors and property lawyers) take responsibility for all subdivisions and/or transfers and guarantee the property rights of the country’s citizens. Only a handful of boundary and/or rights encroachment cases have come before the courts in the last 60 or so years. Reduces conflict between legal land owners. Has historically given great security of tenure to White land owners (and a few land owners of colour), neighbours and banks. A large body of property professionals exist in the country who can be utilized in the land reform process. Most of South Africa is covered by registered real property rights held by people who are not Black (in 1991 Blacks had rights to only 13% of the land). There is little vacant useful state land. To redistribute the land more justly requires an enormous number of subdivisions and transfers of property, utilizing an expensive and time consuming cadastral system. There is path dependence in the property and finance industry. This involves aspects such as: standards of accuracy; the education levels of the person undertaking the work (both formal and through articles); the amount of checking involved; the survey legislation and regulation based requirements laid down by the state; the corporate culture of the property industry; that the system has largely remained unchanged since the 1930s. This path dependence makes it difficult to introduce unpopular changes to the system without rocking the entire property industry, which to a large extent underpins South Africa's economy. It is an expensive system involving highly paid licensed professionals, sophisticated technology, requiring high levels of civil servant management. A large proportion of the country’s population cannot afford to use the present cadastral system (transfers, subdivision of individual plots, boundaries and rights resolution). These factors, and others, have led to the development of informal settlements throughout the country as people use illegal land delivery systems, illegal subdivisions, transfers and sales, while they wait for the legal system to give them legal land rights. Adjudication: the formalisation of unwritten evidence of ownership into sworn written statements to be legally recognised as documentary proof of ownership. The absence of documentary proofs of ownership. Conflicting statements and testimonies by witnesses. Time consuming and expensive court procedure of the disputes. Spatial planning and land reform regulations to be observed. The fraudulent practice of transfer and dealings. Unprotected buyers in good faith. Protection for the real owners. Time consuming and lack of awareness. By area, 86.4% privately owned, 6.9% government owned, 6.7% public owned. In 1995, number of new parcels created by subdivision, 952,000; number created by annexation, 179,000; by initial registration, 2,000. Cadastral staff numbers nationally, 3,646 surveyors, 1758 administrators. 2 universities and 6 junior colleges with Cadastral Departments. Registering and managing the entire territory. Providing cadastral information services using a national online computer network. Establishment of cadastral departments in universities and junior colleges. Lack of accurate cadastral maps. Scattering of the organisations and operations related to land affairs. Duality of the cadastral system and the land title registration system. Total number of land parcels: Nearly 4,400,000 including private and government lands (agricultural land & housing land). Number of parcels with a complete cadastral surveys 0, (in the process to make the cadastral plan in the pilot area). Number of parcels held under some form of title registration “possession right” 451,415. Zoning plan / state reservation and land evaluation. Accelerate land titling and Land registration. Collect land taxes and other national revenues from land. Number of parcels surveyed, adjudicated, and issued with a title deed annually - almost nil. 20,000 new microfilm cards added each year. Public and business confidence in proven system. Restricting use of new technology. Total land area of 33.1 million Ha. Rated as the 60th largest country in the world out of 160 nations. Rated 4th largest country out of the 10 South East Asian nations. 13th largest country in the world by population. 2nd largest country in South east Asia by population. 13 million households, 10.5 million in rural areas, 2.5 million in urban areas. Between 75 and 100 million parcels in the country. Original 1998 Land Law was revised in 1993. Rights in land include: exchange, transfer, inheritance, mortgage and lease. Other land related law includes the Tax law on Agriculture Land Use 1993, and the Tax Law on Transfer of land Use Right 1994. Foreign organisations and individuals may rent land for fixed periods. Restrictions on land use include: 3 Ha for annual plantation land; Government stipulates rates of land use for long term plantation land, bare hilled land and reclaimed land; and the rate of rural residential land for each locality is usually not more than 400 sq. m. per household. Land registration has been completed for 4832 communes (48% of total), 5.2 million households (35%) covering 4.7 million Ha. Of these, 3749 communes and 3.6 million households have been issued with land tenure certificates. 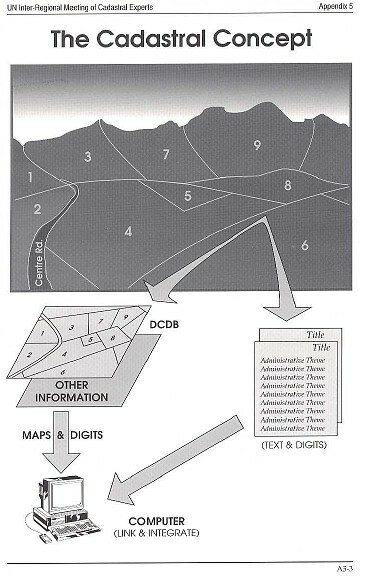 Strategy for a new cadastral system implemented by digital technology. Cadastral system to be fully integrated with land legislation, land registration, land valuation and land use planning. Completed system of land policy and land law. Full funding from government for cadastral implementation. Technical training for cadastral staff at the local level. Implementation of the cadastral system for the whole country. Establishment of an LIS network. All land in Sweden (including governmental land) is registered in the Real Property Register. All of them are surveyed, although the methods have changed over the years. Percentage of parcels in urban areas, which are shown on cadastral maps, 100%. Simple organization and clear procedures, making it unnecessary for land owners to employ lawyers to arrange procedures. The comprehensive registration system, based on the Real Property Register, making all sorts of analyses of data for different public or private purposes possible and cheap through the computerized system. The simple procedures for decision making, where the surveyor can make legal decisions about real property, which if not challenged will gain legal force immediately. There is still a need to develop and make use of the modern technology, both for surveying with help of GPS (reference station system) and to collect and make accessible all old information in digital form and store it in a safe way. The organization can be further developed and consolidated in order to rationalize the procedures and make them cheaper. Next step should be to transfer the responsibility for the title registration to the National Land Survey, in order to make it easier for the general public (only one authority to visit in land matters). The procedures can be even more simplified in order to lower the costs for the general public. Progressive implementation of computer technology. First registration yet to be completed. Lack of definition of forest boundaries. Other government agencies also have land registration functions. Area of the country (45% agricultural area), 30 million Ha. Area of alienable and disposable land, 14.1 million Ha. With completed cadastral survey, 11.7 million Ha, 39%. Judicially registered lots, 3.2 million Ha, 23%. Administratively titled, 5.4 million Ha, 38%. No cadastral survey & no title, 2.1 million Ha, 15%. Time to subdivide (without construction), 3-6 months, (with road construction), 1-2 years. Time to transfer parcels, 1-2 months. It facilitates public land disposition and accelerates settlement and adjudication of land cases and conflicts. It provides economic data for land based development studies and projects and for zoning and land use programming. It is used for land valuation and development of local administration for taxation purposes. Laws related to the cadastral system such as the Public Land Act, the Cadastral Act and others are no longer responsive to needs on the socio-economic and political changes of the country. Inadequate funding for the completion of the remaining unsurveyed municipalities. Low priority in the allocation of public funds because of various competing sectors with higher visibility. The various components of cadastral system is conferred in various government agencies which result in fragmented information on land. Total parcels in England and Wales, 17 million urban, 5 million rural, 22 million total. Registered parcels, 15 million; private deeds, 7 million; number covered by basic survey 100%. New registrations (annually) in England and Wales, 340,000. Transfers of whole parcels, 1 million. Transfers of part parcels, 170,000. On March 19, following the Official Opening by His Excellency Ir. Soni Harsono, Minister for Agrarian Affairs/Head of National Land Agency, all delegates made country presentations. These presentations dealt with Australia, Bulgaria, Cambodia, People's Republic of China, Indonesia, Republic of Korea, Malaysia, New Zealand, Philippines, Thailand, South Africa, Sweden, United Kingdom and Vietnam. The status of countries ranged from where the percentage of parcels shown on cadastral maps was zero at one end of the spectrum to the other end where it was 100%; where the cadastre was a dynamic information tool to where it was in an embryonic stage; where a land transfer took one day to where just the survey plan examination itself may take two or three years; where the private sector was strongly supported to where all cadastral surveying was done by the state; and where the volume of jurisdictional parcels ranged from two million to an estimated 75-100 million. On the surface there were obviously conceptual differences which developed from geographical location, culture, history, the pause point on the political spectrum, the condition of the bureaucratic institutions, the economic well being of the nation and the maturity of the land market to note but a few. Throughout the presentations there were variations on the ideological continuum ranging from socialism to capitalism, on the form of ownership or land use, on the separation of land and building in the transfer process of some countries, of the methodology for service delivery at national or provincial levels, of the view that a registration authority may be simply an instrument of the state or an information provider to the business world, and on the emphasis by most countries on the necessity of computerisation to the need for cheap local paper systems. At the most basic level similar characteristics emerged. Perhaps the most predominant thread was the urgent demand for cadastral systems to support effective land markets which in turn support economic development. The value of social justice, political stability, economic growth and natural resource management found a place in most presentations. But it was also clear there was a view that the success of the cadastral system is not dependent on its legal or technical sophistication but whether it protects land rights adequately and permits those rights to be traded (where appropriate) efficiently, simply, quickly, securely and at low cost. Just as importantly, it was accepted that if the resources are not available to keep a cadastral system up-to-date then there is little justification for its establishment. Whatever the level of sophistication or the maturity of the system, the cadastral system undoubtedly sits within a social, economic and political model. This model rests in a timeframe and should focus on what is possible and what is relevant. The delegates were aware that there is no common note of acceleration for change and that each nation will adopt change at a different and hopefully manageable pace. The form and degree of change, as well as the degree of emphasis on change, is subject to a range of driving forces. Models and rationale for limiting occupancy and use. There was also a strong thread of interest in the financial implications of the cadastral system dealing with the commercialisation of cadastral data and services, the involvement of the private sector and the need to determine value for money in the cadastral processes. It was recognised by all that cadastral and land information systems are increasingly being seen as forms of basic national infrastructure supporting sustainable economic development and environmental management with benefits of both a financial and qualitative nature. Professor D. Grant from Australia chaired the group, which was composed of delegates from Vietnam, Sweden, United Kingdom and Indonesia. The topic was addressed in the context of the model of the cadastre as outlined in the FIG Statement on the Cadastre. This model reflects the growing environmental consciousness and sense of social justice in the developed countries. It is predicated on the fact that properties within a parcel based land system will be soon affected in whole or part by obligations which have not been reflected in the traditional register of land. These include limitations due to environmental, heritage or social factors. The discussion reviewed the generally accepted security of such rights as to buy, to sell, to mortgage, to inherit, to lease, to rent and to enjoy access or the use of easements. Further, the rights of use, such as the right to build, to cultivate, to create change of land use, to enjoy the mineral wealth or not, and the rights to the use of water were considered. Whilst most of the security of rights to land are currently found in the register, the rights to use are not. These rights are generally found in local government ordinances or state legislation. When attempting to consider the obligations of the proprietor or user, the group identified areas of obligation at several levels. These included the national, provincial, city, town, village and neighbourhood levels and resulted from specific legislation, customary practice, social expectations, religion, history and necessity. In one jurisdiction it was noted that there were over 120 statutes which had the possibility of impacting on the use of parcels of land. This is not an uncommon situation in the developed world. It was considered that the driving force for much of the global cadastral change which is currently taking place is to be found in the desire to create or join a land market economy. The group noted that as developing countries plunged headlong towards a market economy with a concomitant abandonment of priceless culture, developed countries in many instances are embracing an environmental attitude towards land development and a social consciousness towards the use of land. The former countries are seeking the streamlining of the land development process, whilst the developed countries are in some cases placing impediments in the path of development due to a sense of obligation, which has recently emerged, to the land. In considering the appropriateness of the cadastre for the identification of comprehensive rights and obligations, the group briefly considered the main objective of the registration system. This objective is to show the ownership and charges on the land. The passage of time since, for instance, the origin of the Torrens System has seen a multiplication of endorsements in the register which have put considerable stress on the effective operations of that register. Simultaneously there has been a growth of unregistered and unregisterable actions which can have significant effect on the use and value of land. These include proposed road acquisitions, building covenants, zoning or heritage restrictions. The group was of the view that since these restrictions or obligations are not now recorded it is not likely, nor desirable, to include in the register the new obligations which are emerging due to the growing social consciousness in developed countries. The group therefore considered that rather than further burden the register, it is more desirable to draw on the existing data sources resident in land related agencies. The group believed this approach will be efficient and meet the current needs of the community in other associated socio-economic applications. Such an initiative must be supported by a concerted program of computerisation. Need to limit the content of the register to maintain clarity and certainty. The loss of cultural wealth as developing countries move towards a land market economy. Need to develop a multi-agency information network to provide a comprehensive record of obligations of the owner or user of land. There is a strong need to fully integrate and rationalise land title registries and cadastral systems to simplify processes, and link and coordinate them with other land administration and management activities, such as valuation and planning. The integration of title registries and cadastral systems, and coordination with other land administration functions, is most important for effective automation, and will need to be supported by cooperative arrangements with the relevant agencies. Funding needs to be supplemented from alternative sources, such as from central government as a means of contributing to national objectives, from local government as a contribution to community development, and from users to meet regular updating and maintenance costs. The development of appropriate structures ensures that while there will be good central direction, standardisation and coordination, there will also be decentralised provision of services and information at local levels. The utility and integration of cadastral information with other processes requires a very clear definition and unique identification of individual parcels. The provision of skilled and competent people in the required numbers is a major challenge, and will require a major emphasis and investment in relevant education and training. The building of local capacity to implement and manage a cadastre will require the development of in-country research and user-needs analysis capabilities. Nationally consistent standards of surveying are needed to ensure that a national survey system is developed and maintained to standards of accuracy appropriate to the circumstances and needs of the individual country. Key questions: Why use provisional titles? What forces a country to use provisional titles? Financial, administrative and/or political expediency. Lack of staffing capacity in surveying, planning, land administration, adjudication. State policy: political and economic issues; protection of country's citizens and/or specific groups of citizens in country, such as apartheid in South Africa. Some provisional titles have time limits and some have no time limit. Provisional titles should have a time limit. Land use controls can be prescriptive or advisory. In urban areas they tend to be prescriptive. People on the ground have little knowledge of land registration and land use information. Generally they are not asked to participate in planning. Dialogue between professions and community should be encouraged for sustainable land use controls. Land use zoning relates to such things as: topography; geology; forestry; city; environment; specific temporary uses; requirements of the wider society versus that of the individual's needs. Strong land use controls limit individual rights and responsibilities. More flexible land use controls give individual more land rights. Colonial laws have left a legacy of inappropriate land use controls in many countries. Often land must remain in the same designated use or be forfeited. Size of parcel is a land use control used by policy makers for a range of purposes. Constitution and land laws affect interpretation of what is meant by full rights (freehold). Some, but not all, countries allow adverse possession. Adverse possession requires a rigorous cadastral system. Need less rigorous system when dealing with informal settlements. Time is one of the bundle of rights in land. We can have a short time period with strong title and/or long periods with weak title. Sometimes land will be forfeited if time requirements are not fulfilled (e.g. houses built). Sometimes there is an inappropriate adjudication law (South Africa). Often the law exists but there is insufficient manpower to implement it. Rights and size of plot should be adjudicated together. If rights are adjudicated first without boundaries it affects the sustainability of land use controls. There is often insufficient evidence of who is the owner and the boundary of the owner. Cannot find claimants' neighbours to adjudicate boundary between them. Conflict between government and customary right holders over the legal status of the land. Does it belong to the people resident on the ground or the government? Adjudication is a major bottle neck in land delivery. Appropriate legal, administrative, institutional and human supports need to be put in place. The land registration process is only part of the adjudication exercise and should focus on core and simple basic land rights. Mechanisms for converting provisional titles need to be developed. Top down land laws and land use controls encourage informal settlement. Habitat II, to be held in Istanbul in 1996, will focus on the cities of the future. High on the agenda are informal settlements in the developing world. Habitat II is also focusing on linkages between rural and urban areas, and experiences in Eastern Europe have shown that cadastral legislation needs to take such linkages into account. Many, although not all, informal settlements have customary tenure as their base. Those areas which are based on customary tenure are generally in the rural areas, although urban areas based on customary tenure also exist. When dealing with informal settlements certain terms need to be defined, especially as these settlements differ from country to country. “Land tenure” is about the relationship between people and the land. It is not necessarily a legal system. It is important to distinguish between a legal and illegal land tenure system in order to understand what makes an informal settlement informal. “Informal sector” relates to economic sector. The term informal settlement relates to land tenure and settlement patterns. “Land delivery” is about turning raw land into urban land; and about subdividing agricultural land. There are both legal and illegal land delivery systems, in both urban and rural areas. Occupation is illegal (trespass). Illegal occupation of government and privately owned land has different characteristics within each country, with respect to the power of government and the power of individual land owners. Land use controls have been infringed. Settlement (customary) exists but the rights have not been adjudicated. Vacant land which has still to be adjudicated is claimed. There are no building permits. Not all countries have informal settlement, but many countries have large informal settlements, namely Philippines, Malaysia, Thailand, Indonesia, South Africa. Given the population projections for the region it could be expected that informal settlements would increase, unless present land delivery systems were adjusted to accommodate the demand for land and shelter. Some solutions to the problem which had been tried were: the building of apartments for the poor; rural industrial development schemes to encourage people to stay in rural areas; forms of provisional title; and new regulations and pilot projects for fast tracking adjudication. Settlement in forests has been a problem, especially where de-forestation has occurred. Some solutions which have been attempted are: special projects which protect group rights in the land registration system; group land settlement areas for shifting cultivators; allowing people access and use of the resource but with no registered titles. Codification of customary tenure to become part of the land law of the country was not a simple process. Also, accepting customary tenure rights into the legal system meant that sometimes there is a conflict over the status of land between the government and customary right holders. Importing customary tenure also secured peoples land rights in such a way that it was often difficult for government to effect development plans, as the local holders' rights could not be moved. The adjudication of customary rights for titling purposes is often fraught with difficulties because of a lack of legal evidence and unrealistically sized land claims. To limit informal settlement development, countries should look at putting in place a halfway registration system which does not change the original ownership but gives protected use rights for a short term as an intermediary step. The laws of evidence should also be reviewed making it easier for these people to be brought into the formal system. When land is registered it increases in value. This could be a major problem in giving some form of occupancy right in informal areas. There were approaches however which made it possible to avoid this problem. Although informal settlement is not a problem in all countries, it is a crucial problem for the planet, as well as the region, with its burgeoning population. New cadastral approaches need to be developed which limit the development of informal settlements by fast tracking legal land delivery. There is increased pressure around the world on the government sector to improve the quantity, quality and efficiency of its services. This results in more countries involving the private sector in the field of cadastral activities, which usually proves to be more flexible to the demand for services and more cost efficient. Within this general trend, a number of variations can be identified revealing the effect of existing traditions, the current stage of cadastral activities, market/economic trends and overall state policy. Examples: Sweden and Denmark, being neighbouring countries with two completely different solutions. In the UK, the Ordnance Survey is still able to provide cheaper services due to better resources. The participation of the private sector leads to the matter of quality control. Who carries out the licensing? The government, or the profession operating as a self regulatory body (the latter can be identified as a future trend). In South Africa and Thailand, the Licensing Boards are statutory bodies which include members from the profession. Although in some countries valuers and architects are deregulated and the market looks after their activities (Victoria), in most countries the government has not relinquished any responsibility for control of the profession—although some other activities may be contracted while the control function continues to be undertaken by the state. Often the process adopted by the government in checking surveys leads to delays which can substantially affect the interests of developers. Who has to be licensed? In most of the countries only cadastral surveyors are licensed; there are examples with countries which have introduced licensing of engineering and topographical surveyors. In the Republic of Korea and South Africa technicians can also be licensed, although they have different responsibilities applying to them. Legal responsibility of licensed surveyors. There are basically two variations. The first is when the government is satisfied by the result of a survey, it takes over the responsibility (New Zealand). In the second case the surveyor is legally liable for the result of survey work, as in Denmark. Public sector commercialisation. For example, at the UK Ordnance Survey (which is in a process of transition with approximately 25% funding and 75% cost recovery), and New Zealand (80%). The position of surveyors (demand for surveyors). In some developed countries (mainly due to the recession) there is an oversupply of surveyors, which results in undercutting of fees to the extent that it calls into question the quality of their services. Examples: in New South Wales there is one surveyor for every 5,000 people, for Victoria this is 1:4,000 and in New Zealand 1:6,000. At the same time, most developing countries have ratios far larger than these. The role of professional organisations (for example, professional indemnity and insurance). The role of licensed surveyors in the conveyancing process. The need for legal training of licensed surveyors was identified. The meeting considered appropriate institutional and technical options for cadastral development to serve the needs of countries with different pre-conditions. The meeting considered land policy in general terms and its relation to the objectives of cadastral reforms, institutional issues including legislation, and organisational and technical options. Land policy is a part of the national policy, which several countries described as being to promote economic development, social justice and equity, and political stability. Land policy may be associated with: security of tenure; land transactions and access to credit; sustainable management and control of natural resources and the environment; the provision of land for the poor, ethnic minorities and women; land use and physical planning; real property taxation; measures to prevent land speculation; and to prevent land disputes. The meeting emphasised the need to establish a coherent national land policy to guide policies within different sectors. The cadastre can support land policies by providing a legal framework for land rights, and changes of land rights to support structural change, information for planning and monitoring of land use, and to provide tools for the implementation of land policies (for instance land consolidation), resolving land disputes or compulsory acquisition of land. Land legislation can provide a variety of rights, depending on the traditions of the country. Land use rights are often based on occupation of land over a long period and can be defined in written law or by traditions (customary law). They can be ownership or ‘more or less’ limited rights, in time and in the rights and obligations of the land user. A long-term leasehold right, that can be transferred, mortgaged and inherited can support economic development in a similarly efficient way as ownership rights. Other types of limited rights can be easements or group access rights, where the right to use the land is connected to membership of a specific group. Rights can also be allocated to apartments (strata titles) or shares in real properties and for joint facilities, such as roads, water and sewerage, yards and gardens. Whatever the types of rights, the cadastre will provide information on the right and its geographical location with more or less accuracy. However, some overlapping rights can only be represented with difficulty on the cadastre. Sometimes provisional titles (qualified titles or similar) can be issued, awaiting a cadastral survey of the parcel or allowing the passage of time to quiet the title. Provisional titles can be used in cases where the issuing of titles is urgent, but the resources for cadastral surveys or title registration are insufficient. If provisional titles become more frequent, they will in the long run represent a threat to the sustainability of the cadastral system. Cadastral legislation relates to the procedures for acquisition of land rights, to changes of established rights through transfers or mutation of the parcels defined by the cadastre, and to procedures for the registration of land rights and changes in land rights. They can include specific measures to provide poor people and women with land rights and to protect particular land uses by ethnic groups. The form and content of land transaction are regulated by law, informal law and custom. Sometimes, title to land can be broken by possession of the land by someone other than the title holder for a considerable length of time—termed ‘adverse possession’. Adjudication is often a major bottleneck in land delivery and affects the efficiency of cadastral records and cadastral information. Adjudication is the procedure to establish rights within a land registration system and enter information of the existing land rights in a registry. Adjudication can be done in a systematic manner area by area, or sporadically, for instance whenever a transaction takes place. Allocation is the process whereby state owned land is allocated to different users. Land parcels can be subdivided, amalgamated and mutated. Land can be compulsorily purchased if needed, for instance for public purposes. The legislation should provide for secure, efficient and transparent procedures which allow participation by the local community. Legislation should be flexible and able to be changed due to new developments over time. Monitoring and control of land use is an important cadastral issue. Land control is motivated by population pressure on land use and by environmental concerns. A policy, expressed by legislation, can be introduced based on a classification of land for agriculture (forestry) and urban development. Land use control in rural areas is often exercised through plot sizes, and in urban areas through planning control. The regulation should be applied with the participation of the land users in the planning process, in a democratic and fair manner. Monitoring schemes will be needed, as well as flexible rules for the change of land use. Cadastral organisations also have, in many countries, the responsibility for land registration. If the responsibility for cadastral surveying and mapping, and for land registration, is divided between two organisations, close links will need to be established between the two. Even within one organisation, close links are needed if the responsibility is divided between different departments. The cadastre represents a major component of the land data infrastructure, which serves many purposes. If the data base is going to serve these purposes, linkages need to be established with other data bases, such as data for land use planning, taxation, valuation, local authorities (sometimes with village authorities), and housing development boards. If the cadastre does not include land use rights, linkage to that registry is also essential. These linkages will improve access to the data, reduce duplication, and avoid ambiguity. Combined efforts will create more efficient land management. The administration of cadastral systems can be centralised. From the user’s point of view, data collection as close to the source of the data as possible is desirable. On the other hand available resources, both human and technical, and cost-effectiveness can make centralised solutions more feasible. The cadastre is part of the basic infrastructure of a country and should therefore be the responsibility of the government. However certain tasks, for instance data collection, technical work as surveying and mapping, and sometimes even updating, can be contracted out to private contractors depending on the type of work and the responsibilities involved. So called Build-Operate-Transfer (BOT) solutions have so far not been practised widely, but might be an option in future. Cadastral activities can be financed by governmental funds, either provided by the government or through loan and grants from international or bilateral funding agencies. They can also be funded through charges on land users, other users such as utility companies, or through special taxes—for instance, transfer taxes or land taxes. These methods can be combined. Established cadastres are increasingly recovering at least operation costs. In developing countries, the rural population and some sectors of the urban population usually have only very limited capabilities to contribute to costs for cadastral operations. Investments in the establishment of cadastres are usually borne by the government. Other key issues are education and training, human resource development, research and development, and international cooperation with regard to cadastral development. Communication issues, for instance logistics and information communication, need also to be investigated. If private surveyors should be involved in cadastral mapping and surveying, it is necessary to define functions for licensing surveyors and regulations of accountability and control. Studies of needs and the market are desirable and solutions should be designed to encourage true competition in the private sector and to avoid self-regulating monopolies. Accountability and quality assurance are to be preferred before general checking by a State body. Technical options for the development and maintenance of the cadastre were considered by the delegates. Considerations covered the different needs of countries at different stages of development. The major factor addressed was the identification of the need for, the appropriateness of, and the phasing in of, computerisation to the cadastral environment. A number of aspects were addressed which both covered processes like cadastral mapping and systems like land registration. No distinction was made between these two in the consideration and a number of issues were identified and options analysed. There is a place for both or a combination of the two. Any move towards the adoption of a program of computerisation should be subject to the availability of trained staff or contractors, access to maintenance and support staff, adequate communications, and a suitable storage capability. The move to computerisation should bring security to the cadastral system, greater accessibility to information, and will overcome the deterioration of records in paper form. Assuming that resources are available and there is political commitment to succeed, the first decision to be made is the time of commencement. It is unlikely that all jurisdictions will be in a position where standards are in place which deal with data formats, where exchange protocols are developed and where logical data flows have been identified. However, it is essential that a needs analysis be conducted for the subject jurisdiction. This analysis should cover the current situation and the desired objectives which should be both feasible and sustainable. Any computerisation program will also define the establishment costs and the need for additional investment at specific milestones. Short, medium and long term priorities must be established and agreed by all stakeholders. There should be a phased program based upon need, geography or political dictates. It is likely that emphasis will be given to the textual data sets moving through graphical data conversion and the establishment of the fundamental spatial data bases—ultimately leading to an automated mapping capability. While the long-term result will improve system functionality and linkages between the components of the cadastral system, it is essential to achieve short term results to demonstrate what the future will bring. This is best done by comprehensive pilot projects where issues of data conversion, standards and the updating and upgrading of contents can be developed or proved. Significantly, this approach will also indicate the appropriate characteristics and shape of the national spatial data infrastructure which will evolve. An objective of a pilot project should be both educational and capacity building. Computerised indexes should be an initial development, to provide at the strategic level a statement of data available throughout the cadastral system. Initially such indexes will provide rapid access to existing manual records. At the tactical level, emphasis should be placed on the careful selection of a unique parcel identification system. Resultant efficiency will depend on this choice. Such a unique identifier system may not rely on any title or valuation reference. It should be capable of describing any polygon or real estate object, be it registered, private, state or community owned. It should be so designed as to meet future socio-economic needs of statistics, electoral and census analysis. Existing systems should be considered and if necessary preserved for their own specific application, provided they can be directly linked to the unique parcel identifier. However the national or jurisdictional unique identifier should be developed within its own hierarchal framework. There may well be social and historical reasons for maintaining the ability to produce paper titles. This may be by way of automated paper copies from an electronic base. Ultimately the aim should be the production of electronic titles for improved efficiency, particularly relating to dealings in the mortgage market. Any move to reliance upon electronic titles must be accompanied by a change of approach to the certification of documents. This will bring a recognition of the adoption of risk management through quality assurance. It must also be recognised that they should be linked to a national framework and standards. Microfilming and video imaging are technologies which have a role in cadastral reform. Microfilming is an important tool for maintaining a backup record of title and cadastral map records. However it is still a manual system with (very often) slow access time. Video imaging, records images of title and cadastral maps on video laser disks provide very good archiving of records and rapid access and copying. However the records have no ’intelligence’ since they are simply images. It is not possible to search textual data within the record for example. There are considerable benefits in the use of video imaging for the retrieval of large data files dealing with, for instance, population and taxation details. Undoubtedly computer maps, or at least the computerisation of mapping data, are essential for effective management. They are easy to maintain, once appropriate procedures and systems have been developed, but expensive to create where significant data conversion is required. They are easy to reproduce but require significant training and considerable expenditure on hardware and support systems. Decisions must be made at the initial stages of development as to the level of accuracy required, on the needs of integration between text and graphical data, and how to deal with an exponential increase in functionality. As with computer titles the user will, for some time, demand a paper product from the electronic source. Initially it is likely that an emphasis will be placed on cadastral mapping for land rights assessment and initial allocation within a national spatial plan. Detailed surveying will follow to define land rights and use rights. This may result in a move from the graphical disposition possible from cadastral mapping, to numerical description through survey, and finally a coordinated cadastre supported by geodetic control. Both the systematic and sporadic approach may be adopted. Several jurisdictions have developed local systems which are being revisited to adopt a uniform national system. Developing countries, where possible, should adopt a national framework to maximise the integration of future data sets which require spatial rigour. Such spatial stability can be achieved by coordinated or isolated survey systems or a combination of both if effectively planned. The approach will depend on the resources available, national need and the political aspirations of the jurisdiction. The choice of technologies will depend on resources and the subject land, be it urban, rural or remote. This is usually a function of land value. The adoption of technology should be phased based on the urgency of the task, the geography, the desired standards and the use of the private sector. It may well require the re-engineering of manual systems before the introduction of new technologies. Field operations should also be phased and the technologies may range from GPS to the plane table. The steps may well commence with large scale photomaps for planning and adjudication purposes. The use of small format photography for urban planning may be appropriate while GPS airborne cameras with little ground control may serve the needs of small scale photography for remote areas. EDM and total stations could be subsequently used for boundary demarcation with the plane table involved for rights determination in informal or transitional settlements. A National Spatial Data Infrastructure should be established to ensure a uniform approach for maximum integration, integrity, and security of data; effective resource use; and the development of a comprehensive land information system. Topographic and cadastral data bases should be integrated and uniformly based on the national geodetic network to ensure future data set integration. The preceding document is a summary of the deliberations of the meeting. All delegates were satisfied that the Terms of Reference for the meeting were adequately addressed. An Executive Summary of the meeting, including recommendations, was prepared, which has been termed "The Bogor Declaration". The Declaration has been published separately. International Federation of Surveyors, 1995. Statement on the Cadastre, 22 pp. United Nations 1972. Report of the Ad Hoc Group of Experts on Cadastral Surveying and Mapping. New York. United Nations 1985. Conventional and Digital Cadastral Mapping. Report of the Meeting of the Ad Hoc Group of experts on Cadastral Surveying and Land Information Systems. Economic and Social Council E/CONF.77/L.1. United Nations, 1996. Guidelines on Land Administration for Countries in Transition. Economic Commission for Europe. Williamson, I.P., 1996, “The Justification of Cadastral Systems in Developing Countries”. Submitted to Geomatica, 20 pp. Arrival of Delegates and Participants. Registration. Working Groups to consider the material presented and to discuss and document the identified issues to improving efficiency and effectiveness of cadastres and land markets based on the strengths and weaknesses of respective countries. Madam Yixi Liang, Director-General, Lands Department, Guangdong Province, 498 Dezhong Road N., Guangzhou, P.R. China. Madam Chen Xiang Lan, Vice Bureau Chief, Land & Real Estate Bureau, Shantou Province, P.R. China. Mr Yan Zishan, Land Surveying and Mapping Institute, Guangdong Province, 468 Huanshi Road E., Guangzhou, P.R. China. The United Nations, with the expert assistance of the International Federation of Surveyors (FIG) and other relevant organisations, support the preparation of a regional and global compilation of optional components of a cadastre, including legal aspects, land policy, institutional arrangements, technology and economics. As a result, a Cadastral Expert Group Meeting will be held in Bogor, Indonesia from 18-22 March, 1996. The United Nations is working closely with the International Federation of Surveyors (FIG) in organising the meeting. In simple terms the meeting is required to develop a document setting out the desirable requirements and options for cadastral systems of developing countries in the Asia and Pacific region. The meeting recognises that all countries have particular needs and requirements but that countries at similar stages of development have some similarities in their requirements. As such the meeting will look at the requirements of three groups of countries, namely newly industrialised countries such as Indonesia, countries at an early stage of transition such as Vietnam and the South Pacific countries. United Nations 1973. Report of the Ad Hoc Group of Experts on Cadastral Surveying and Mapping. New York. However the key to a successful cadastral system is one where the three main cadastral processes of adjudication of land rights, land transfer and mutation (subdivision or consolidation), are undertaken efficiently, securely and at reasonable cost and speed. As such the meeting will concentrate on these three cadastral processes to help identify desirable or appropriate options for cadastral systems. In considering the range of options differences will be highlighted for the three groups of countries identified above. In order to prepare for the meeting each participant from either a developed or developing country is requested to prepare material on the following topics for their country, state, province or jurisdiction as appropriate. Please prepare overhead transparencies for each topic as set out below. Describe the land transfer process and show as a series of dot points on one or two overhead transparencies. Identify the respective roles of the land owner, purchaser, surveyor (? ), lawyer (? ), government agencies, local authority or village etc. Describe the process to adjudicate land rights and show as a series of dot points on one or two overhead transparencies. Identify the respective roles of the land owner, surveyor (? ), lawyer (? ), government agencies, local authority or village etc. Describe the mutation process (subdivision or consolidation) for land parcels and show as a series of dot points on one or two overhead transparencies. Identify the respective roles of the land owner, developer (? ), surveyor (? ), lawyer (? ), government agencies, local authority or village etc. The International Federation of Surveyors Statement on the Cadastre highlights the importance of the Cadastre as a land information system for social and economic development from an international perspective and recognises the central role that surveyors play in the establishment and maintenance of Cadastres. The statement does not recommend a uniform Cadastre for every country or jurisdiction, but gives a range of options in establishing and managing a Cadastre. A Cadastre is normally a parcel based and up-to-date land information system containing a record of interests in land (eg. rights, restrictions and responsibilities). It usually includes a geometric description of land parcels linked to other records describing the nature of the interests, and ownership or control of those interests, and often the value of the parcel and its improvements. It may be established for fiscal purposes (eg. valuation and equitable taxation), legal purposes (conveyancing), to assist in the management of land and land use (eg. for planning and other administrative purposes), and enables sustainable development and environmental protection. Cadastral Reform is concerned with the improvement of cadastral systems. information about the parcel, eg. location, size, improvements, value. The Cadastre is a land information system, usually managed by one or more government agencies. Since information about land parcels is often needed by many different users, a unified Cadastre helps to avoid duplication and assists in the efficient exchange of information. Land Tenure is concerned with the rights, restrictions and responsibilities that people have with respect to the land. The Cadastre may record different forms of land tenure such as ownership, leasehold, easements, mortgages and different types of common, communal or customary land tenure. Documentation of informal or customary rights is sometimes connected to the establishment of land markets. In other cases the purpose can be to document customary tenure systems for land management purposes without changing the nature of the system or tenure relationships. In both cases it is essential that such reforms are only started after careful investigations of the need for and the consequences of the reform. Land registration is the official recording of legally recognised interests in land and is usually part of a cadastral system. From a legal perspective a distinction can be made between deeds registration, where the documents filed in the registry are the evidence of title, and registration of title, in which the register itself serves as the primary evidence. Title registration is usually considered a more advanced registration system, which requires more investment for introduction, but provides in principle greater security of tenure and more reliable information. Title registration usually results in lower transaction costs than deed registration systems thereby promoting a more efficient land market. Land registration (land titling) can be undertaken sporadically at the time of each legal transaction or systematically area by area. While the sporadic approach gives more immediate benefits to individual land holders, the systematic approach provides a wider range of benefits more quickly, especially if the land registry is part of a more comprehensive land information system. The basic unit in a Cadastre is known as the parcel. A parcel can be an area of land with a particular type of land use, or an area exclusively controlled by an individual or a group. A property may consist of several parcels. The flexibility of the definition of a parcel makes it possible to adapt the cadastral system to various circumstances, for instance to include large parcels to represent the interests of land use in traditional tenure systems. Boundaries of parcels can be defined by physical demarcation on the ground or by a mathematical description usually based on a coordinate system. The accuracy and consequently the cost of cadastral surveys is dependent on the accuracy needed for boundary descriptions. The accuracy should reflect factors such as the value of the land, the risk and cost of land disputes and the information needs of the users of the Cadastre. Modern technology, such as modern survey instruments, satellite position fixing (Global Positioning System - GPS), aerial photography and photogrammetry can offer new possibilities to increase the speed and lower the costs for cadastral reform. Computer technology can usually provide better access to information, better manipulation of cadastral data, better quality, and better legal and physical security than manual systems. To fully utilise modern technology it is important to have trained personnel and facilities to maintain the equipment. Unfortunately this infrastructure is not found in many countries thereby limiting the use of modern technology. The Cadastre is a public land information system and should therefore be managed or supervised by the Government. In some countries, new organisational arrangements for the implementation of systems are being investigated, such as joint ventures or partnerships between government and the private sector or contracting out specific activities to the private sector. In other countries, the cadastral organisation has become more independent in terms of management and financing from government budgets. In both cases a more direct financing of cadastral operations is sought through cost recovery or even to generate government revenue. However this can not replace basic governmental investments in spatial infrastructure such as a national coordinate system. A Cadastre must be demand driven; that means it must fulfil the demands of its clients and that it needs to be coordinated with other land information systems. The Cadastre supports the public administration of land. The information in the Cadastre can be used for the formulation, implementation and monitoring of land policies, such as those concerning land redistribution, land consolidation, land acquisition and allocation, and land markets. Cadastral data should be accessible to the general public. However the cadastral system must include measures to protect individual and private interests from misuse of the information provided. A successful Cadastre should provide security of tenure, be simple and clear, be easily accessible, and provide current and reliable information at low cost.